Having never been to Iceland and having a near pathological hatred of the cold, I was intrigued to discover what it was about Iceland that would lead the author to have such a love affair with an entire country. However Edward Hancox uses his broad knowledge, extensive travels and love of Icelandic music, culture and food to bring alive an entire nation and culture so beautifully I find myself wanting to don the layers and brave a flight. An enjoyable read, it went very quickly due to the easy flow of the writing, the conversational style and humour laced throughout it. Hancox dismisses a number of myths about the Icelandic people and draws on the many friendships he has forged to “access all areas” and gain an insight into Iceland that you won’t find in any travelogues or rough guides. Having been to Iceland on one occasion I thought I had ticked off this as a destination visited…”been there and got the hat/t-shirt/fridge magnet”. After reading this wonderful book I have come to realise there is so much more to the island than the capital city. The book is wonderfully written and very witty which skips along at a lovely pace and keeps you thoroughly entertained. 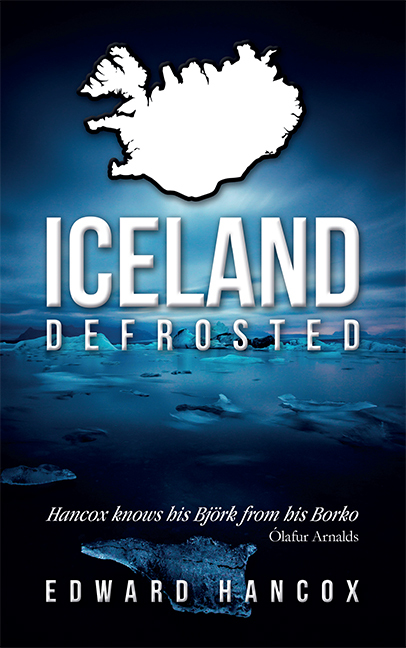 Iceland, Defrosted is a must-read book if you have been to Iceland, planning on going, or just interested in this strange but beautiful island. I must thank the author for sharing his entertaining tales of his adventures in Iceland. I’m not going to bother with a detailed review. Let’s just say that if you’re thinking of a trip to Iceland, read this great book first. It’s full of useful stuff, plus it’s a pleasure to read. Being from Iceland I was wonderfully surprised by the book. The auther takes a wonderfull view of the country and I loved reading the book, chapter by chapter, night by night. i loved it! I love Iceland, Icelandic people, culture and everything about this odd little Island. This is more than a travel book, in fact it inspired me so much that before I got to chapter 3, I had already booked my next trip there. If you only ever read one book about Iceland make it this one. And if you are planning to go to Iceland – GO – no, really GO! and take this book with you. Just be prepared to catch the virus, everyone who goes there has to go again and again. Well, where do I start? Having known the author for a good few years I know he would expect an honest review from me! The book is good, surprisingly good in fact. Ed takes you on a tour of a place that I have never been to but like other reviewers would now like to visit. The book is written in an easy to read style and I can easily imagine being sat in a pub listening to Ed reciting it (albeit over a warm English ale). He really has done himself proud with this book and deserves all the praise he has received. I really enjoyed reading this book, which is more than just a guide to Iceland, it’s an insight into it’s culture through the people, music, food and landscape. You might not have been to Iceland before reading this book, but by the time you finish you’ll definitely have added it to your list of places to visit. This book could be described a modern day follow up to Halldór Laxness Icelandic sagas charting the progress of one man, and the friends he makes along the way, as he follows Route 1 around Iceland. His passion for the people, music and coffee is very engaging as is his blind faith that one day he will see the Northern Lights. If you’ve been to Iceland before then you’ll recognise many of the landmarks and if you haven’t, then why not? Read this book and you’ll wish you were there too. Thoroughly enjoyed this insightful book on Iceland. Would definitely recommend for those thinking of visiting Iceland or for those of you wanting to learn about all it has to offer from the comfort of your home. If, like me, you’ve already been severely bitten by the Iceland bug (fourteen trips to date and hopefully more to come) then this is the book to tide you over until your next trip. If you haven’t yet been and would like to go, or are merely interested to learn about Iceland, then this is the place to start. Edward Hancox is an amusing and self-deprecatory – but never silly – guide to Iceland’s unique landscape and culture. He too has a severe case of Icelanditis and pops up there whenever he gets the chance to sample its beauty, food, music and sheer differentness, and to enjoy the company of his Icelandic friends, so fiercely proud of their very special country. I found myself agreeing with most, in fact nearly all, of what he has to say, and when an author highlights somewhere really special – in this case the isolated hotel at Búðir on the western peninsula of Snæfellsnes – in exactly the same terms and way you yourself feel about it, you know you’re in good hands (just as with the late and much-lamented Roger Ebert’s film reviews). And, despite being pretty familiar with most aspects of Iceland, I still learned stuff I didn’t know. A great bonus too, and a real rarity these days, the book is really well-written, always interesting … and not a single typo or spelling error in sight. Hooray! Read it now and go to Iceland soon, before the increasing number of tourists swamp it – and go independently if you can (it’s easy enough) as you’ll see and learn an awful lot more just by stopping as and when you please. After reading the majority of Iceland Defrosted you can really tell how much passion and enthusiasm goes into Mr Hancox’s trips to Iceland. Instead of just going for the generic “what shall I do as a tourist out there” he appears to immerse himself in the culture, digging deep to find what no tourist ever would. It’s refreshing to read how much detail goes into finding out about all the little nooks of Iceland, and the way in which is wrote is very excitable, making you almost feel as if you was there finding out about these things alongside him and immersing yourself in the culture. Adding touches and his own unique experiences to the book makes it that much more personal and close to home, instead of just reading the robotic you should do this this and this. It makes you want to travel, not only to Iceland but elsewhere and get the feelings that he has from your own experiences, and really opens your eyes to the fact that you yourself should look deeper next time your away! Congratulations Mr Hancox, an inspiring tale of adventure that truly does make you want to read on. At last someone who was able to put into words (the love of Iceland and everything connected to it) what I struggled to explain to my friends and family for years. I felt like this book was written especially for me. I thoroughly enjoyed this book, wasn’t able to put it down and finished it in one night. If you only read one book about Iceland this is the one! Iceland and Icelanders have been a subject of vertical exploration to me in the past few years. On my first encounter I spent several weeks on a remote farm. On other occasions I’ve been travelling, or discovering Reykjavík through its Menningárnótt or Airwaves music festival. Yes, sometimes it feels like an obsession. Hence I was intrigued and thrilled to hear that someone is writing a book about it. Edward has a great talent in exploring and presenting the dimensions that I find truly meaningful about Icelanders to a non-Icelander. On top of that his book is fun to read, it is written with a great sense of humour and I can only recommend it to other Iceland enthusiasts. I devour travel books! 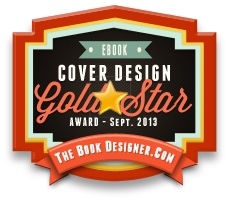 – Even the free amateurish Kindle ones. To join someone in their journey and share their thoughts and experiences is often just as rich an experience as visiting the places yourself. Therefore I consider myself an unofficial aficionado of travel writing and I will happily place Edward Hancox on my pile of favourite travel authors, keeping Bill Bryson, Paul Theroux and Kari Herbert company. I have always been intrigued by Iceland and like many I have carried a long held desire to see the Northern Lights and experience the midnight sun among other things. After reading this book there are about a dozen other things that are now on the list. Iceland definitely has to be the next stop! It is obvious from his writing that he adores the place and I was rather surprised to discover that he isn’t already living there. That fascination and love are contagious and help to raise the book above the normal travel fare. I highly recommend getting this book if you are planning a visit to our Icelandic neighbours and I suspect that even if you weren’t planning a trip before, once you have read this book you will be! It is with some trepidation I review Iceland, Defrosted. Firstly, because I’m on good terms with the author and secondly because I’m mentioned in the book. It would be very easy for me to sign off on a five star review based on these facts but I’m reviewing the book objectively as I would any other. Honestly. Without a doubt, this is Edward’s love letter to Iceland. Like a tempestuous lover, Iceland can leave him breathless one instant and crestfallen the next. At one moment in the palm of his hand, in another, distantly out of reach. The joy of Edward’s book is he writes about such extremes with the knowledge that he’s a hopeless romantic, head over heels regardless of the disappointments that she occasionally throws his way. And like every smitten fool, Edward wants Iceland all to himself. Well, not exactly. This is a travel guide of sorts after all! But if you covet Iceland then you must treat her lovingly. Make the effort to get to know her. Because despite his protestations to the contrary, the feeling I get from the book (the passage about the Australian backpacker for example) is that Edward doesn’t want to share this gorgeous lady (and to Ed Iceland is definitely a lady) with boorish Wham! Bam! Thank You Mam! types. And so Iceland, Defrosted takes you off the well trodden tourist safari. Visits to far flung villages on the premise his favourite band or musicians played/live there abound. Treks to the country side for a dip in a hot pot have never sounded so exciting. Likewise, Edward’s love of the native animals takes him to islands, cliff edges and arctic beaches. Throughout, Edward writes with an easy familiarity of his subject. And in a very human way. Very occasionally this means the book reads more like a personal blog than a book (the description of his 30th birthday celebration for example) but I defy anyone who has fallen in love with a place not to be moved by his revelation in a remote countryside churchyard. Edward’s passion for Icelandic music does feature but if your not a fan of Bjork ‘weirdness’ or know your folktronica from your electronica don’t worry. The passages on the musicians and music add colour to the picture Edward is painting. The unique landscape, weather and people are the fine brush strokes. In summary, this is not a Lonely Planet guide. Those are for the people peering through steamed up windows on the back of the bus. This is a handbook whose pages smell of fermented shark that you can tuck into your winter-coat pocket and read over one of those fantastic sounding Icelandic beers. Found this book online on our return from our third trip to Iceland. Undoubtedly, it’s a must-read if, like Ed and many of the other reviewers, you’ve got the Iceland bug but I think it would make a good introduction to the country for anyone thinking of going there for the first time. I liked the style of writing – very flowing and relaxed; a bit like Iceland really! Ed is witty but never resorts to sarcasm to get a cheap laugh or at the expense of the Icelandic people. I loved that – shows real respect. I had a great time reading this book – it took me back to a place I love. I hope he writes a sequel! Having visited Iceland many times in the last decade I’m always on the look out for any new travel books to take on my trip. Edward Hancox’s book did not disappoint!! He really does capture the essence of the Icelandic experience which, as he acknowledges, you really can’t get from one 3 day trip around the Golden Circle!! It was wonderful to find someone who understands why people are crazy about the place and he writes in such an entertaining style that you will find yourself laughing out loud at some of his experiences. Ed gives a fantastic insight into his passion for Iceland and detailed descriptions of his trips. He Inspires with information about where to go and hints towards some lovely sounding guesthouses and restaurants. The book is really well written, feeling like you could be talking to a friend but also with some practical information and history too. I would definitely recommend this for anyone going to Iceland, living here of just curious to find out more. This book is excellent and I highly recommend it. Having been to most of the places visited plus others, the only downside is that it has only increased my longing to book a 7th trip to Iceland which sadly my bank account won’t allow at the moment. Whether you love Iceland or have never been there – you will enjoy this book. Firstly, I should make it clear that I’m not a big fan of the cold (although I do love the snow), my dream holidays are somewhere hot and sunny with a pool and cocktails and I generally find travel guides and bit dull and contrived. Then I read Iceland Defrosted. It’s brilliant and I am determined to visit Iceland as a result. You can genuinely feel the love and enthusiasm that Ed Hancox has for the country, its people, places and customs, in a richly-woven yet easy to digest prose that feels more like he is there telling you all about Iceland in person rather than from the pages of a book. It is less of a travel guide and more of a tribute to what I know agree must be an incredible country. In fact, I was so impressed that I purchased a second copy for my brother-in-law and his girlfriend, who have booked a trip there later this year. All the must-see tourist spots are covered (including the winkie museum! ), along with many lesser-known places. You genuinely feel the internal struggle that the author has telling you about those, as though he is torn between letting the world know their wonder and keeping them a secret so he can enjoy them without hoards of other tourists descending. I’m sorry to say that I will be one of those tourists one day! I have read books by established authors that have significantly less skill with the written word than Mr Hancox and, had I not known otherwise, would not have believed that this was his first book. By the end of it, you feel as though the Icelandic friends he talks about are your friends too and find yourself wishing you were there to eat skyr and drink beer with them too. If you are planning a visit to Iceland, read this book. In fact, even if you’re not planning to go and have never even considered it as a place to visit, read this book anyway. You’ll be looking up flights to Iceland before you know it. Iceland has always appealed to me as somewhere I would like to visit, but has so far eluded my travels. A book about one man’s passions for a country that is neither his place of birth, or his place of residency? This in itself was intrigue enough to buy the book and find out what drives the passion. What I found most striking throughout the book is the friendships that have been developed between the author and his Icelandic friends, this gives a real insight into the true Icelandic way, happy to help, and eager to please, whilst being fiercely proud of ones heritage. The book is some part travel documentary, some part chasing of elusive dreams, but due to it’s casual prose, reads as if the author is regaling his adventures to you friend to friend. If you have an interest in Iceland, travel, or just the joy of exploring, this passionately written book will keep you entertained from cover to cover. As guilty as most non-Icelanders of having cliched and limited preconceptions of what Iceland is like, I was very happy to be enlightened by this very likeable, readable commentator as he shared the benefit of his intimate knowledge of this remarkable country. But it’s not just the country that Edward Hancox describes so well – it’s also the creative, generous spirit of Icelanders. For example, 1 in 10 Icelanders will publish something in their lifetime – but as they’re all avid readers too, there’s no shortage of a local marketplace to sell their books. Just as well if they’re all written in Icelandic – though I bet there are plenty in other languages too. Still, you’ve got to admire a nation that can abolish the letter Z (in 1973, I think the author said). 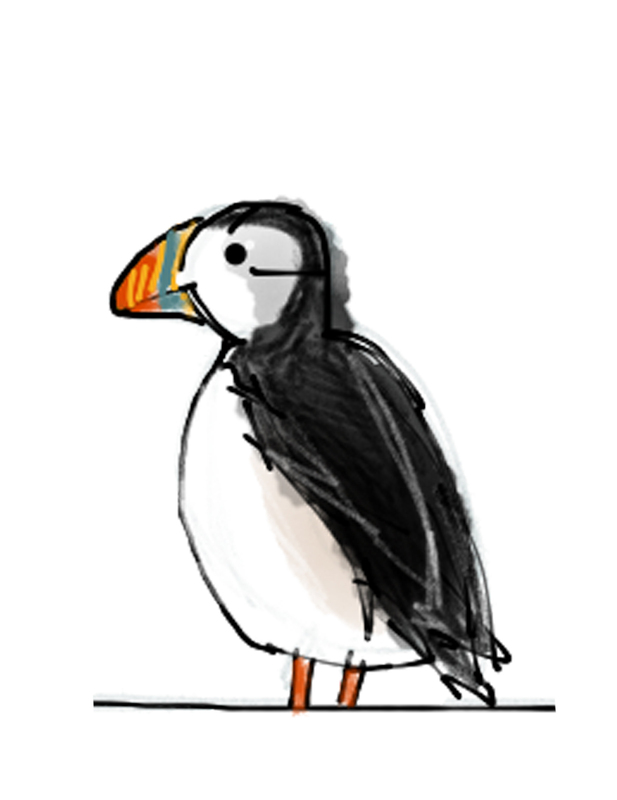 Lots of other equally fascinating snippets pop up on every page, the sort of thing that you just have to read aloud to whoever is in earshot – did you know that a young puffin is called a puffling, for example? 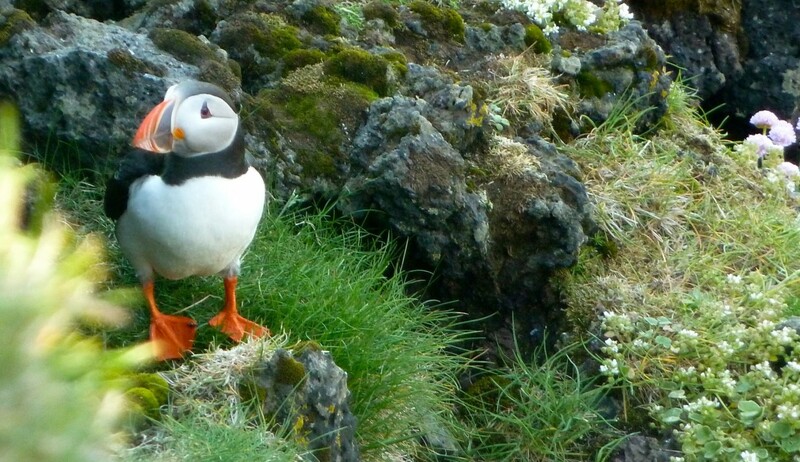 Gotta love those puffins! And that Arctic comes from the Greek for bear, so Antarctic means “without bears”? Brilliant! All the advice you could ever need for a trip to Iceland.